ConceptDraw is a powerful cross-platform professional business graphics application that will help you visualize and structure information, add illustrations and drawings to your documents. 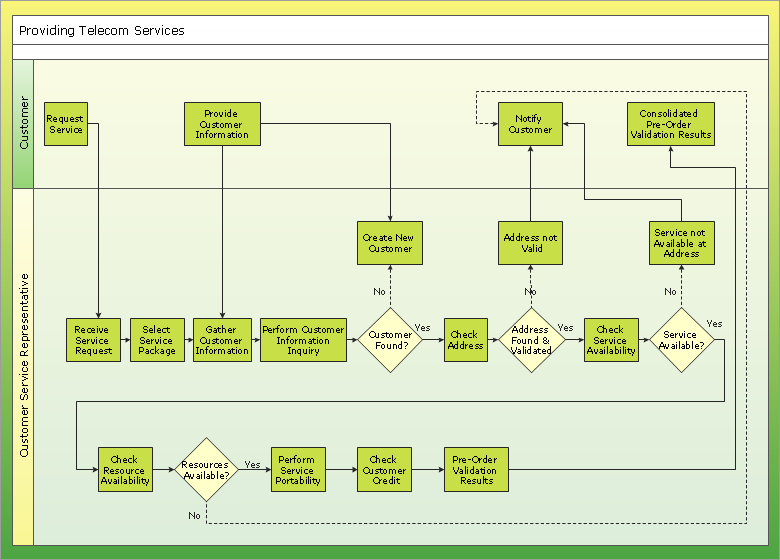 Flowcharts : Basic flowcharts, Audit Flowcharts, Cause-Effect (Fishbone) Diagrams, cross-functional vertical and horizontal diagrams, data flow diagrams, opportunity flowcharts, workflow diagrams. Project management: Gantt charts, Project Schedules, Pert charts, Calendars, Timelines, planners. Block Diagrams and Bar Charts. Pyramids, Target diagrams, Venn diagrams, other marketing diagrams. Even if you are not a real artist, this business visualization tool is for you. ConceptDraw DIAGRAM contains hundreds of built-in collections of task-specific Symbols, Templates and Wizards that allow managers to quickly create professional-looking charts and diagrams. Use a variety of drawing tools, smart connectors and shape libraries to create flowcharts of complex processes, procedures and information exchange. Define and document basic work and data flows, financial, production and quality management processes to increase efficiency of you business. ConceptDraw contains libraries and templates for audit flowcharts, data flow diagrams, cause & effect diagrams, cross-functional flowcharts and more. Represent the company's structure and detailed staff information as a single or multi-page org chart. Support for multi-page documents allows to create very complex and detailed charts, connected with hyperlinks, which can be then exported to HTML for use on the corporate Web site. Outline project schedules in clear Gantt charts and timelines, assign milestones and deadlines, use a number of smart calendar shapes. Your schedules can be printed, published on the web or exported to PowerPoint for a presentation. Draw and print out simple project timelines with ConceptDraw. Templates and pre-drawn shapes help you do most of tasks requiring no high-cost specialized software. Illustrate market survey results, create comparison charts of competitive products, use Venn charts to analyze existing opportunities. Compose a full set of charts and diagrams to overview different marketing aspects. Use pre-drawn shapes of office equipment and furniture to create office and home plans quickly and easily. Create office and home plans, security plans, plant layouts, HVAC schemes, floor and building plans with ConceptDraw DIAGRAM and many others. Use layers, customizable grid and guidelines, hundreds of pre-drawn shapes. Use ConceptDraw for sketching parking plans, driving directions, create schemes of road accidents. A large collection of geographic libraries contains shapes that accurately represent all countries and continents. ConceptDraw DIAGRAM v12 is a powerful tool that helps you create professional looking cross-functional flowcharts with the well-designed objects. ConceptDraw DIAGRAM v12 - Drawing Software for Vertical Cross Functional Flowchart. ConceptDraw allows you to focus on work, not the drawing process. ConceptDraw Arrows10 Technology allows to draw connectors with smart behavior that gives flexibility to you during work process. Column chart examples from ConceptDraw collection can help you find the best visual depiction for you data. You can easily modify column chart examples according to data you want to visualize.